ANGEL VI Gear is a DLC Gear Set in The Surge. "Manufactured exclusively by CREO's Japanese subsidiary TENSHI SYSTEMS, the 'Angel VI' is the latest model in a successful series of space exo-rigs custom-made for extreme conditions. Originally designed for labor-intensive tasks in hazardous environments, it will withstand extreme duress for prolonged periods of time, keeping its wearer focused on the task ahead." "Wearing a full set of ANGEL VI gear increases attack speed, energy gain and impact for all 'Codename' tools." ANGEL VI Gear is worn by two enemies in the Abandoned Production, one near the first Smelter Bot and another in a hollow rocket shell in the area before the Ops building. The ANGEL VI Gear provides a slightly weaker defense than the RHINO Gear despite requiring more materials for each upgrade. It, however, requires lesser Tech Scrap per upgrade compared to the RHINO Gear, although the cost difference is not that much. The ANGEL VI Head Gear provides immunity to toxic gas but the whole set is not immune against toxic puddles, like in the Toxic Waste Disposal and Toxic Waste Maintenance at Central Production B. This set along with evasive stamina reduction implants allows you to become the BLOODBORNE. Attack during dash frames and smash everything to death with repeated quickstep strikes. All pieces are always armored, and it doesn&apos;t matter what you&apos;re using. The main point is to let him heal. He will always heal ONCE at low health, allow him to do this and you&apos;ll have enough damage in him the second time to ensure the part dislodges. TBH this armor set is complete garbage, the Lynx set (while offering less armor SLIGHTLY) keeps me alive more than this set does by a long shot. The weapon is worth keeping, slow as it is, it hits like a truck. So my advice is to get that and upgrade it. Armor is crap, at least in my experience. The defense is negligible, which is ridiculous considering the effort one needs to equip the armor. Another thing! It takes a metric ton of core energy just to equip the set. Grinding to get the energy isn&apos;t recommended, as you&apos;d be making things more difficult by keeping the cap for which you gain free heals higher than you&apos;re likely to get to. Frankly this armor blows chunks, especially for the effort it takes just to make and equip it. How do you kill it if your a new player like me all I have is : reinforced pipe as my best weapon so what weapon should I use ? I&apos;e been killing and targeting Angel arms for decades but I still cant seem to obtain the schematics for them. I&apos;m attacking the first two angels in the game. 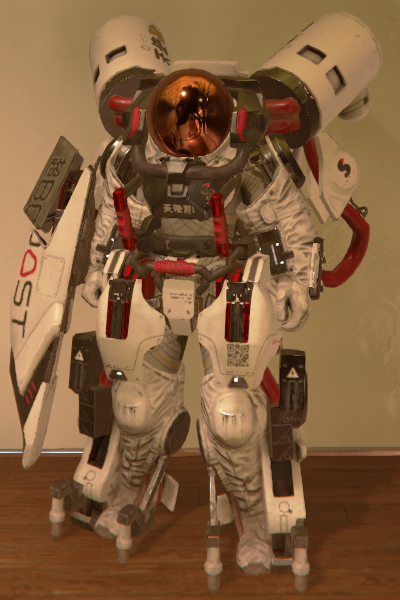 Wearing the Angel VI head gear dives you immunity to toxic gas, like the Elite Hazard gear.